Author(s): Yanfei Wang, Zhihua Zhang, Xuli Zhai. Petrochina Petrochemical Research Institute, Haidian district, Beijing, 100195, China. Hydrocracking catalysts consisting of metal and microporous molecular sieves play an essential role in petroleum industry. This review summarizes the compositions, preparation approaches and applications of hydrocracking catalysts based on molecular sieves. Specifically, this review includes: (i) a brief overview of selected methods of direct synthesis and the post-synthetic modification of molecular sieves; (ii) an introduction of the existing strategies to incorporate metals with microporous molecular sieves to prepare bifunctional catalysts, e.g., impregnation and ion exchange; and (iii) a summary of various hydrocracking catalysts for long chain paraffins and aromatics. Keywords: Bifunctional catalysts, hydrocracking, molecular sieves, post-synthesis modification. Affiliation:Petrochina Petrochemical Research Institute, Haidian district, Beijing, 100195, China. Keywords:Bifunctional catalysts, hydrocracking, molecular sieves, post-synthesis modification. Abstract:Hydrocracking catalysts consisting of metal and microporous molecular sieves play an essential role in petroleum industry. 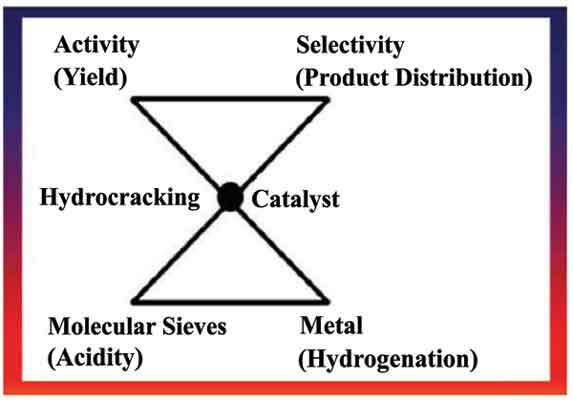 This review summarizes the compositions, preparation approaches and applications of hydrocracking catalysts based on molecular sieves. Specifically, this review includes: (i) a brief overview of selected methods of direct synthesis and the post-synthetic modification of molecular sieves; (ii) an introduction of the existing strategies to incorporate metals with microporous molecular sieves to prepare bifunctional catalysts, e.g., impregnation and ion exchange; and (iii) a summary of various hydrocracking catalysts for long chain paraffins and aromatics.